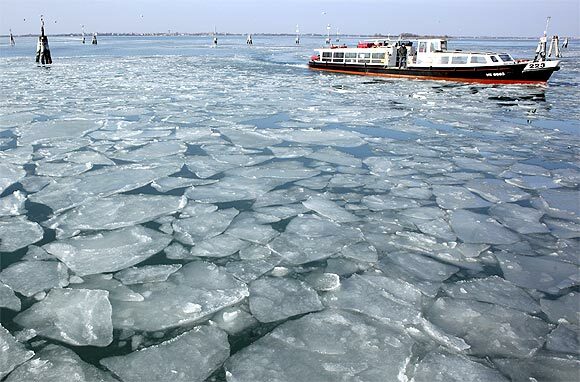 A boat is seen at a frozen lagoon in Venice on Tuesday. Bitterly cold weather sweeping across Europe claimed more victims on Sunday, brought widespread disruption to transport services, and left thousands without power with warnings that low temperatures would continue into next week. 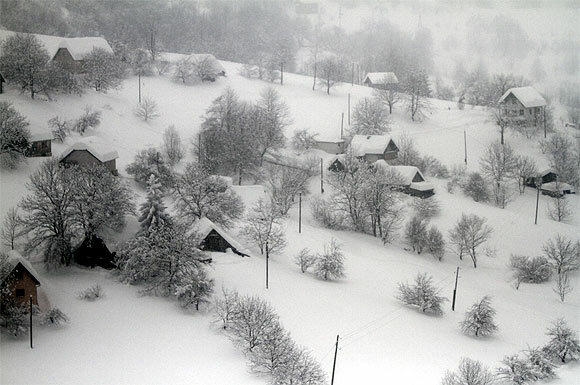 Aerial view of an isolated village cut off by snow in eastern Bosnia and Herzegovina. Europe's bitterly cold weather killed another 33 people on Monday, with Bosnia recording its eighth victim after an 87-year- old woman died of hypothermia. Farmers were having problems feeding cattle because of the snow and milk production had dropped by 15 to 30 per cent in the country, the Bosnia's farmers association said. 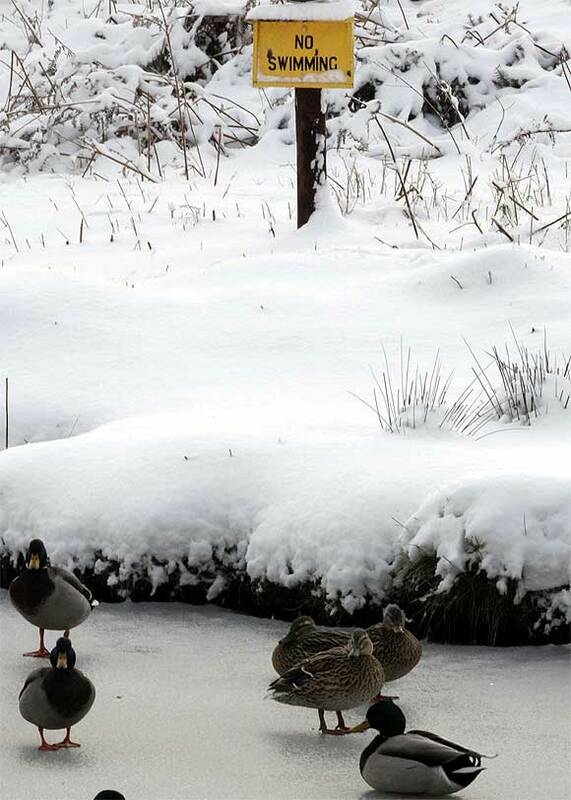 Ducks stand on a frozen stream in Newtown Linford, central. Heavy snow fell in some areas of Britain overnight, causing road closures and flight cancellations, and the Met Office warned of icy conditions, local media reported. 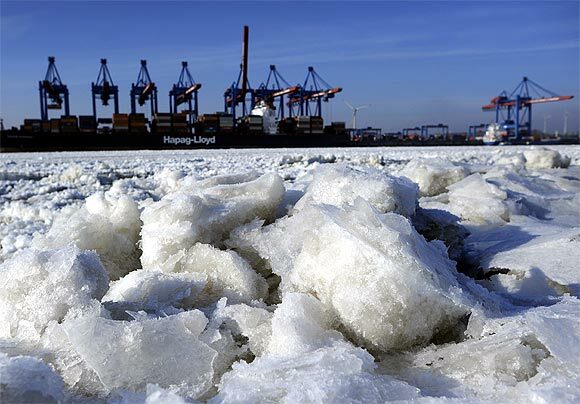 The frozen Elbe river is pictured at the container terminal Altenwerder in the harbour of Hamburg. Bitterly cold weather sweeping across Europe claimed more victims on Sunday, brought widespread disruption to transport services, and left thousands without power with warnings that low temperatures would continue into next week. 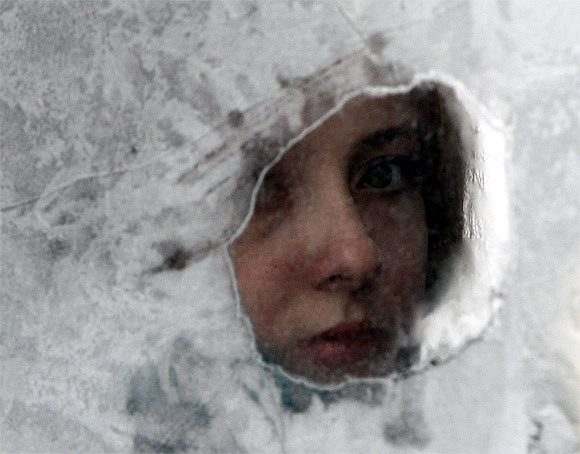 A woman looks through a window of a minibus taxi covered with hoarfrost with the air temperatures at about minus 13 degrees Celsius, in Kiev. The Australian Broadcasting Corporation website said that in Ukraine 131 people have died, while 1,800 people have been hospitalized. About 75,000 others have sought warm shelter and food. 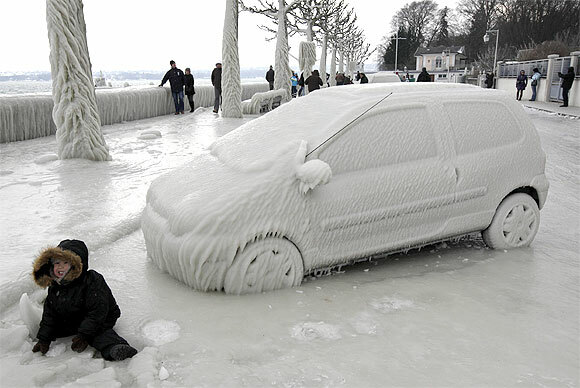 A boy sits in front of an ice-covered car in Versoix near Geneva. The big freeze has caused traffic chaos throughout Europe, blocking roads, shutting down airports. 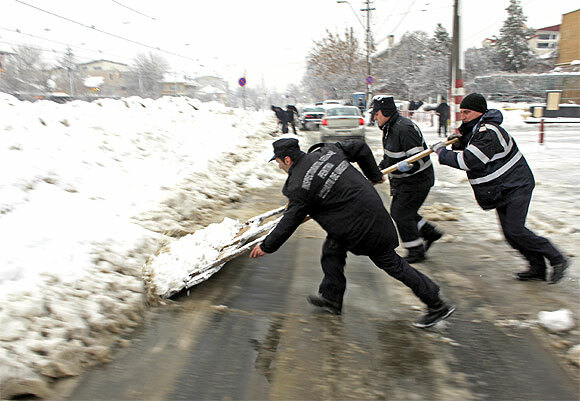 Firefighters clear the snow in front of their station in Bucharest, Romania. Overwhelmed by deep snow and harsh temperatures, some countries in Europe closed down schools and struggled to run public transport. 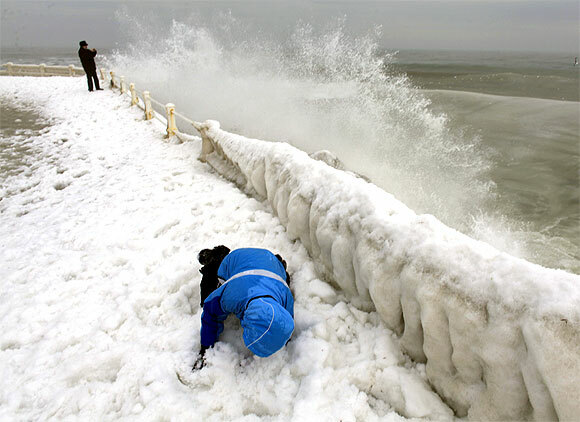 A child crouches as he protects himself from a wave on the shore of the Black Sea harbour of Constanta, 250 km east of Bucharest. 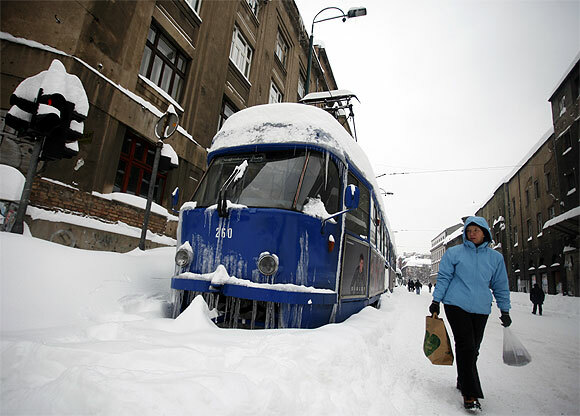 More than 56 trains were cancelled on Friday in Romania due to heavy blizzards. 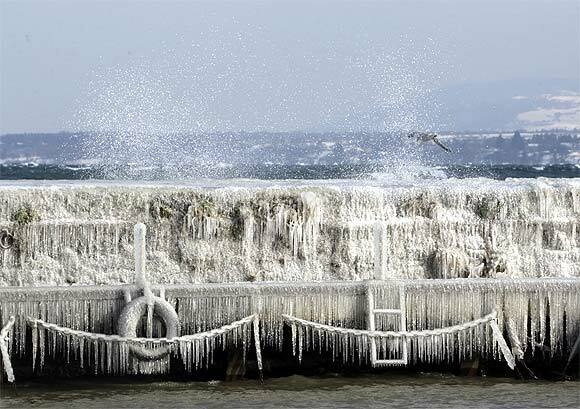 Waves hit an ice-covered wall on a windy winter day in the harbour of Versoix near Geneva. A pedestrian walks past a tram stopped along the main street during snowfall in Sarajevo. The Serbian government has so far declared a state of emergency in 19 municipalities in the south and east, where six people have died from cold. 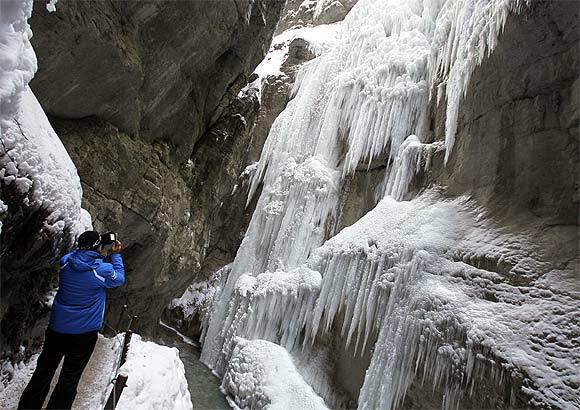 Huge icicles are seen in the Partnachklamm, the gorge of the small river Partnach in Garmisch-Partenkirchen in the early morning, as sub-freezing winter temperatures continue in Europe. 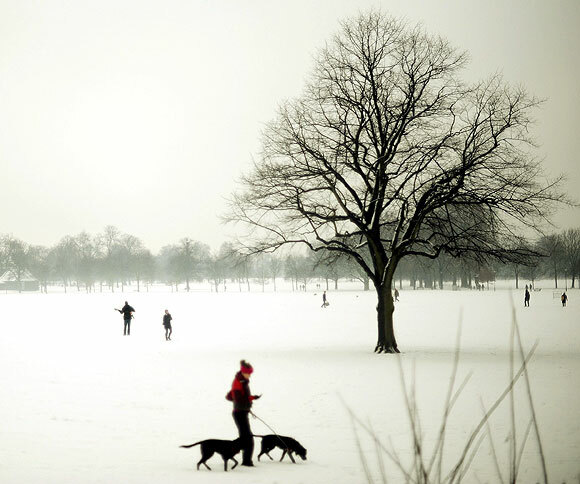 A woman takes her dogs for a walk across a snow covered Clapham Common in London. As temperatures dipped to well below freezing at the weekend, 600 flights were delayed or cancelled at Heathrow, despite just 7.5cm of snowfall, disrupting the plans of as many as 18,000 travellers. London's Daily Telegraph newspaper reports all five terminals at the airport have now resumed normal operations. 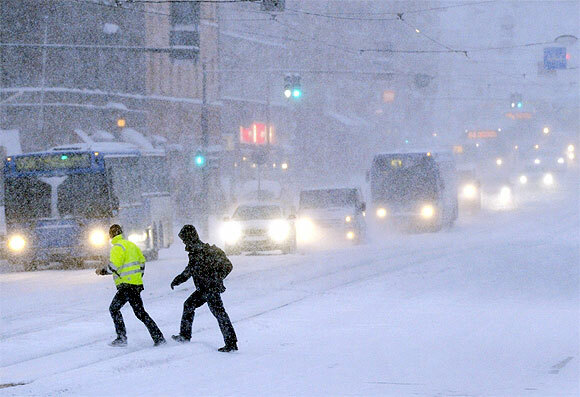 People make their way across a road during heavy snowfall in downtown Helsinki, Finland. 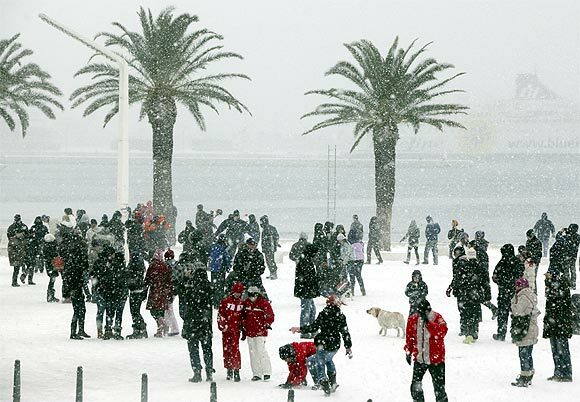 People walk along a snow covered street at Adriatic city of Split in Croatia. But the cold has also offered opportunities for snowy fun. Women pose for a photograph sitting next to a snowman in Victoria park in east London.